Greetings fellow X-Carvers! I’ve not been very active here but have learned loads from the forums, and have owned an X-Carve for just over a year now. 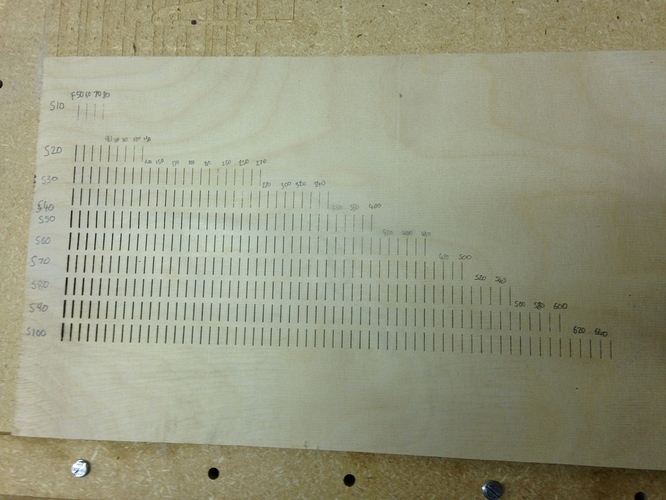 I did all the usual mods while assembling it (X+Y axis stiffening, crimp connectors, adding a second MDF wasteboard and flattening) and used it to build three hurdy gurdies, amongst other things! There are a multitude of these laser diode+controller packs available from China on eBay, from 1W to 12W. They typically don’t come with any documentation so it took some experimentation to figure out how to connect it. 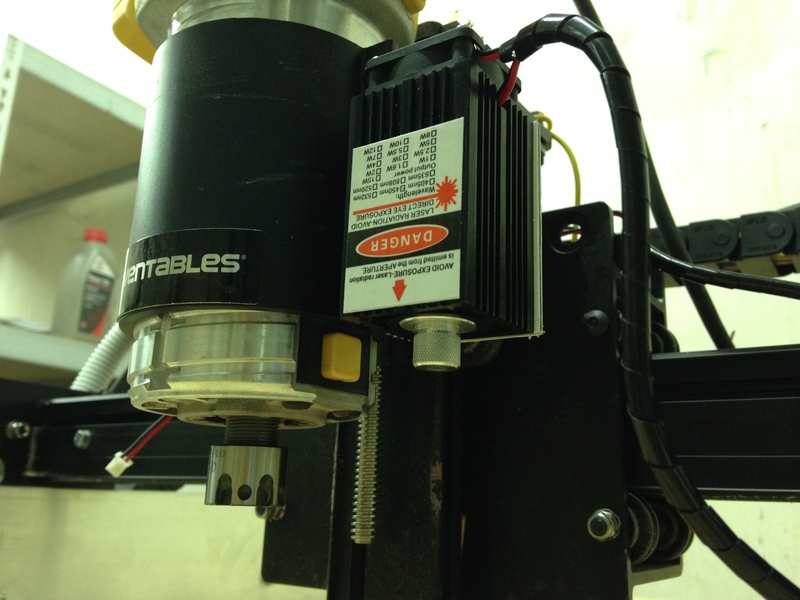 I routed a quick plastic bracket to attach the diode next to my spindle. 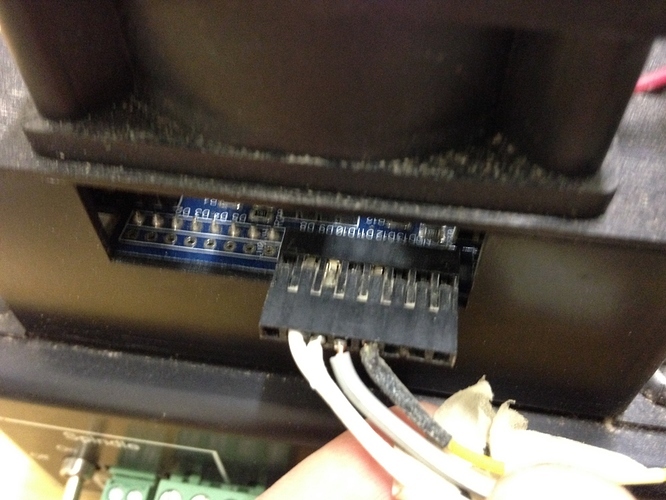 My driver module required a 12V DC power supply, and then had a connector for ground and a 5V PWM signal, the duty cycle of which controls the laser power output. I tested this with a PWM signal from my Analog Discovery 2, and plugged it into gshield pin D11 (grbl spindle PWM output) after confirming it worked. The latest build of grbl (1.1f) from Inventables supports laser mode, which makes some changes to the way M3-5 commands are handled, as well as making some changes to the acceleration to try to ensure linear laser power application. All I had to do to set up laser mode was to activate it with $32=1 and set a max speed of 100 with $30=100 so that the laser power could conveniently be expressed as a percentage. If you use a speed-controllable spindle then you’ll either have to change this setting every time you change to laser mode, or express laser power in terms of your max spindle speed. One confusing thing I found about M3 (always-on) laser mode was that the laser wasn’t always on. I had to send an empty G1 command to turn the laser on for focusing, and then it would turn off again every time a G0 was sent. I suppose this is a good safety feature, but does seem to contradict the laser mode documentation. Generally I set up the laser (positioning, focusing) in M3 and then switch to M4 for cutting. This shows that whilst cutting through anything other than paper probably isn’t possible with this little 1W diode, I’ll be able to get some really nice results engraving into wood, and hopefully other materials. 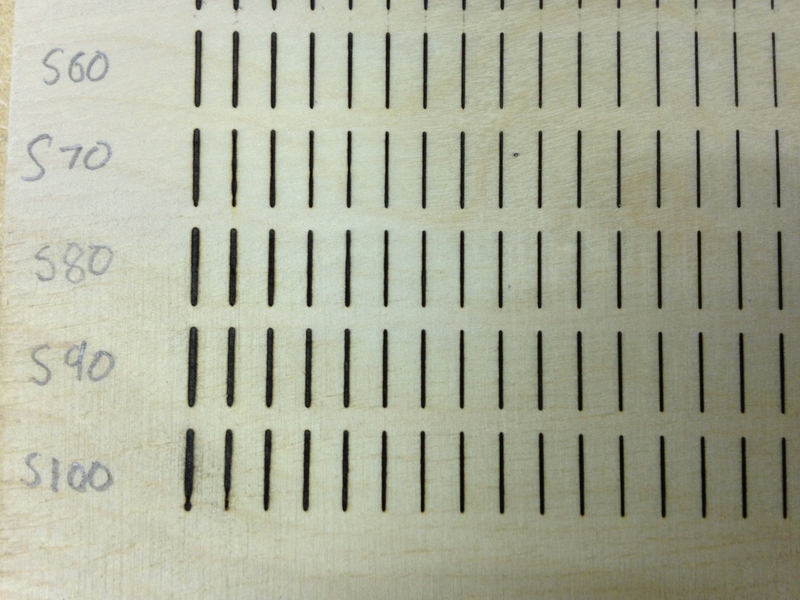 I was really hoping that I’d be able to run the laser engraver without dust extraction (i.e. much more quietly than milling!) 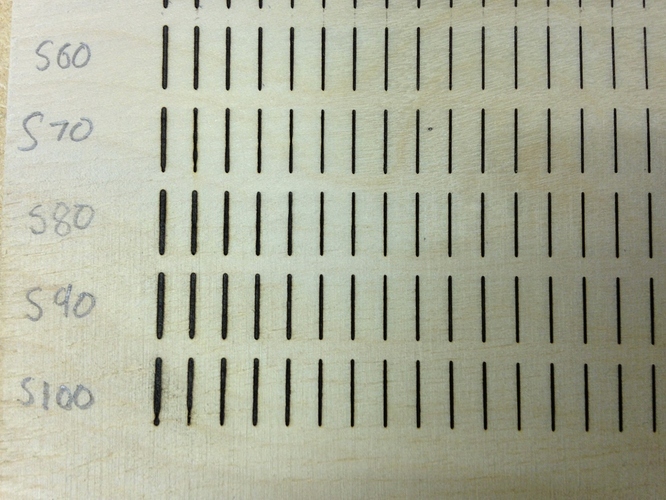 but quickly noticed that the laser would often hit puffs of smoke generated from cutting, leaving gaps in the cut. Dust/fume extraction and high diode power levels are definitely a must for good results! This version of grbl supports both spindle and laser, but does not change the way G-code commands work. Interesting, I read through that thread but I don’t really understand what the advantages of this version of the firmware are? I’m quite happy with Inventables’ 1.1f, and can always put it back in spindle mode to have the laser on all the time for focusing and positioning. If you are doing raster images in laser mode the 1.0c version is faster than 1.1f. With a 1 watt laser this is probably not a problem for you. Another reason is that this version will work with any CAM program. 1.1f has some modifications to the way G-code works in laser mode and if your CAM program is not aware of them then you can get unpredictable results which may have your laser turn on when you don’t expect it to. If you are happy with 1.1f then there is no need to change.